Cam's Cinematic Episodes: Film Review - THE VISITOR: This One Deserves Some Hospitality. Film Review - THE VISITOR: This One Deserves Some Hospitality. You probably don’t know Richard Jenkins by name. He’s one of those reliable character actor types who can always be depended on to add a certain amount of low-key professional quality to star-driven vehicles. Whether playing Jamie Foxx’s CIA boss in The Kingdom, Heather Graham’s quadriplegic step-father in Say It Isn’t So, or Charlize Theron’s conflicted dad in North Country, Jenkins has been working steadily and skilfully, showing an impressive range and chameleon-like ability to disappear into a role. It’s not uncommon for these kinds of talented actors to spend an entire career lost in the background. Occasionally though, with proper support, they find themselves occupying the lead role in a truly wonderful piece of cinematic artistry. It is to our benefit that Jenkins has done just that, starring as an introverted economics professor in the powerful new film The Visitor. His character, Walter Vale, is a man who has withdrawn into his own skin, and become removed from the world around him . 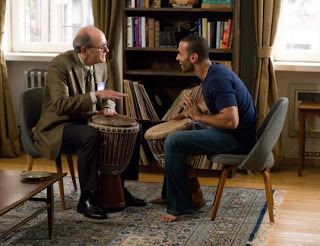 It isn’t until he discovers illegal alien couple Tarek (Haaz Sleiman) and Zainab (Danai Gurira) squatting in his New York apartment that the seeds of spiritual rebirth are planted. A frustrated wannabe pianist, Walter grows increasingly intrigued by Tarek’s musical mastery of the African drums. The duo’s bond over a shared love of music is abruptly put to an end, however, when Tarek is arrested and placed in a detention centre. 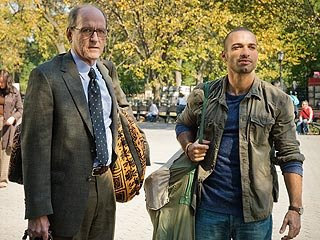 While Walter searches for a legal answer to his friend’s increasingly serious troubles, Tarek’s fiercely independent mother arrives. Played by Hiam Abbass, she further stirs Walter’s emotional growth, and we are treated to one of the most subtly powerful romantic relationships in recent cinematic memory. 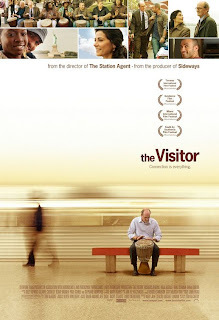 The brilliance of The Visitor is its effortless aptitude for presenting a stirring political statement, the frustrations with the post-9/11 U.S. Immigration system, through the lives and interactions of its characters. Writer/director Thomas McCarthy, whose sole previous helming credit was the w ell-received but little-seen The Station Agent, shows a startlingly well-honed ability to write fascinating three dimensional characters, as well as a deep understanding of natural human comedy. There is not a single false moment over The Visitor’s entire 104-minute duration. We believe these people and are invested in their hopes, dreams and fears. Its amazing work and will likely lead McCarthy towards a prosperous and creatively rich future. A lion’s share of the credit must also be given to Jenkins. Dressed in drab colors and owlishly peering out through thick frames, Walter hides behind a projected image of overbearing academic superiority. However, the actor allows the viewer t o see through the illusion, and into the soul of the character. What we observe there, Walter’s innate goodness and longings for love and acceptance, makes Jenkins’ portrait all the more moving. Pay close attention to the evolution of how he smiles over the course of the film. Initially appearing as insincere reflections of his discomfort they gradually transform to mirror Walter’s acceptance of happiness, particularly in the movie’s powerful music scenes. The supporting cast is ideal. Haaz Sleiman is a real discovery, emanating good-will and warmth. We can understand why Walter is so taken with him, and thus his unfortunate situation is all the more heart-rending. His ability to enliven the characters around him is sorely missed when he is separated from them. Equa lly strong is the impassioned performance of Hiam Abbass, who is a perfect match for Walter. Her determined pride and subdued loveliness is a perfect counterpoint for his drab, reserved mannerisms. It’s a rarity in modern films that we can find enjoyment in the simple act of on-screen conversation, but The Visitor makes their verbal communications as riveting as any blockbuster money shot. It’s unfortunate that this film is being released now, in this season of superheroes and whip-cracking archaeologists, as one has to wonder whether audiences will care about a story as delicate as The Visitor. The performances and direction are so uniformly f antastic that it may have gained more attendees (and awards notices) in the fall season. Regardless, I emphatically urge you to seek out this gem for yourself. Sometimes it’s refreshing to take a break from the CG explosions and view something with substance and a real comprehension of emotional truth. The Visitor is such a film, and it deserves our support.